For the first time in history, a commercially-built and operated American crew spacecraft and rocket, which launched from American soil, successfully made its way to the International Space Station and back home. 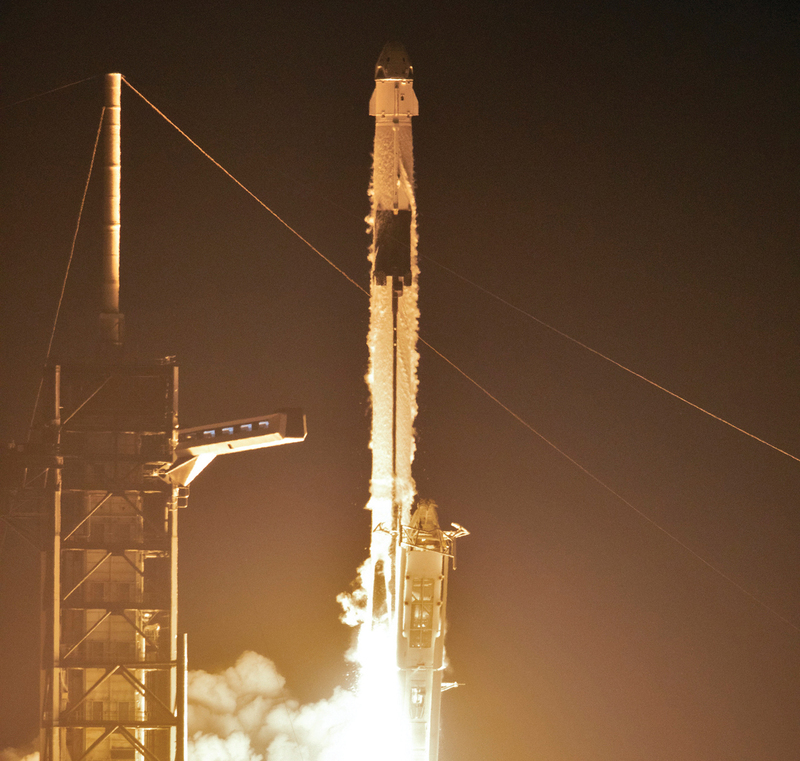 The SpaceX Crew Dragon spacecraft lifted off March 2 on the company’s Falcon 9 rocket from NASA’s Kennedy Space Center in Florida. About six hours after departing the space station March 8, Crew Dragon splashed down at 8:45 a.m. EST approximately 230 miles off the coast of Cape Canaveral, Fla. SpaceX retrieved the spacecraft from the Atlantic Ocean and transported it back to port on the company’s recovery ship. Known as Demo-1, SpaceX’s inaugural flight with NASA’s Commercial Crew Program is an important uncrewed mission designed to test the end-to-end capabilities of the new system. It brings the nation one-step closer to the return of human launches to the space station from the United States for the first time since 2011 – the last space shuttle mission. Teams still have work to do after this flight to prepare the spacecraft to fly astronauts. The best way to advance the system design was to fly this spacecraft and uncover any other areas or integrated flight changes that might be required. The program demonstrates NASA’s commitment to investing in commercial companies through public-private partnerships and builds on the success of American companies, including SpaceX, already delivering cargo to the space station. Demo-1 is a critical step for NASA and SpaceX to demonstrate the ability to safely fly missions with NASA astronauts to the orbital laboratory. The first crewless test flights have been delayed again, NASA has announced. The space agency said the first uncrewed test flight by SpaceX’s Crew Dragon – previously planned for around Feb. 23 – is now scheduled for no earlier than March 2, with its second test flight with NASA astronauts Doug Hurley and Bob Behnken now scheduled for July. Meanwhile, Boeing’s uncrewed test flight of the CTS-100 Starliner in March is now scheduled for no sooner than April, and its crewed test flight with Boeing astronaut Chris Ferguson and NASA astronauts Nicole Mann and Mike Fincke scheduled for no sooner than August. NASA has awarded Leidos of Reston, Va., a contract for information technology (IT) end-user services to support the agency’s headquarters, centers and other performance sites. NASA End-user Services & Technologies (NEST) is a firm-fixed-price, indefinite-delivery/indefinite-quantity contract that has a maximum value of $2.9 billion and includes a two-year, three-month base period followed by a two-year option, one-year option, and five one-year award term options that would extend the period of performance to May 31, 2029. NASA personnel use IT to support the agency’s core business, scientific, research and computational activities. Leidos will provide, manage, secure and maintain these essential IT services for the agency. As the building of the new San Jacinto College Center for Petrochemical, Energy and Technology nears completion, two companies have donated a total of $500,000 for an analyzer lab and for education and training. Siemens has donated $250,000 to add an analyzer lab to the new center that is expected to open this fall while Dow Chemical has donated another $250,000 to ensure that training and the education curriculum in the center will align with the needs of petrochemical manufacturing employers. Siemens, a global powerhouse focusing on electrification, automation and digitalization, has been among the college’s industry partners providing input and donations toward the project since the start of discussions about the San Jacinto College petrochemical training center. San Jac broke ground for the $60 million center in September 2017. In addition to an associate degree and certificates, the college is pursuing the approval and development of a bachelor’s degree in applied technology. Besides being an industry partner and member of the College’s Petrochemical Advisory Council, Dow Chemical Deer Park has hired 25 SJC graduates as operators in the past four years – or 23 percent of the site’s new hires. Dow also has established an apprenticeship program at the college. In highlighting a host of achievements this past year, Port Houston Executive Director Roger Guenther announced several records were broken in 2018, including that total tonnage at the port set a record of 35.7 million tons – an increase of 9 percent from 2017. “The strength of cargo activity helped drive operating revenue to $366 million for the year, shattering the previous record set in 2017 of $333 million.” Guenther said as he delivered his 2018 year-end report to the Port Commission of the Port of Houston Authority during its first monthly meeting of 2019. Combined business through the port’s public facilities also generated a total cash flow of $162 million, surpassing the previous record of $151 million set in 2017. 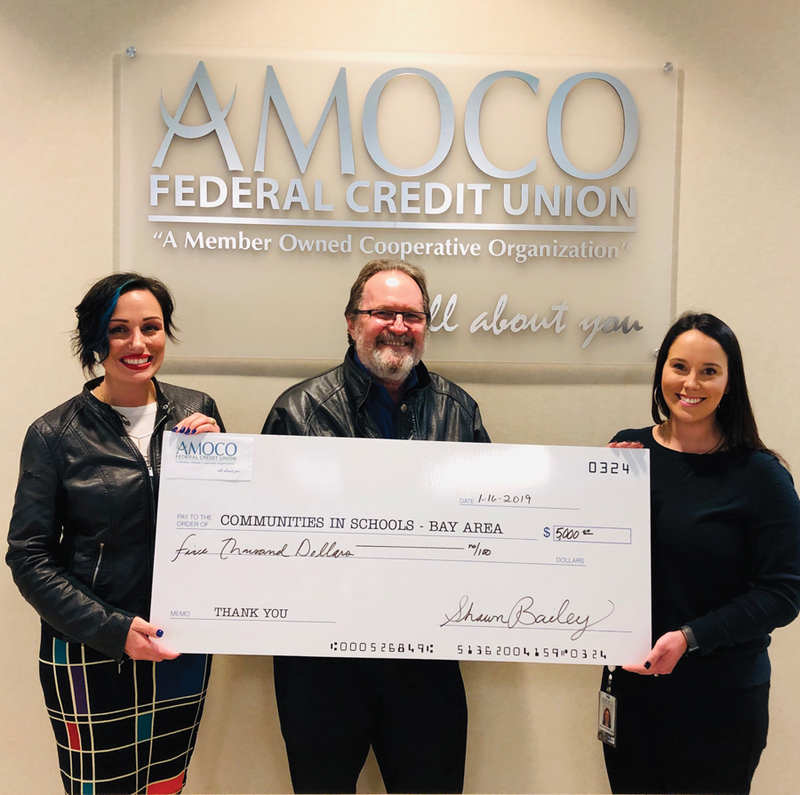 Presenting AMOCO Federal Credit Union’s sponsorship check for the Keep Kids in School Golf Tournament is (right) Stacey Malbrough with Communities In Schools-Bay Area’s Hillary Gramm, resource development director, and Dr. Peter Wunschel, executive director. Since 2006, Amoco Federal Credit Union has supported at-risk students through the annual Keep Kids in School Golf Tournament sponsorships totaling $109,000. 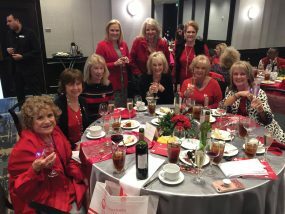 The golf tournament benefits Communities in Schools-Bay Area, a dropout prevention program serving 26 campuses in Clear Creek and Dickinson ISDs. This year’ shamble tournament will be Monday, April 15 at Bay Oaks Country Club in Clear Lake. In addition to sponsoring the tournament, Amoco staffers serve the students in different ways. Amoco’s Stacey Malbrough, culture and communications manager, mentors a League City Elementary School student in the program and works on the Raise Your Glass to CIS wine tasting event committee. Josh Ryding, Friendswood branch manager, works on the Keep Kids in School Golf Tournament Committee. For sponsorships or golf tournament information, contact Hillary Gramm at hillaryg@cis.org or 281-486-6698. 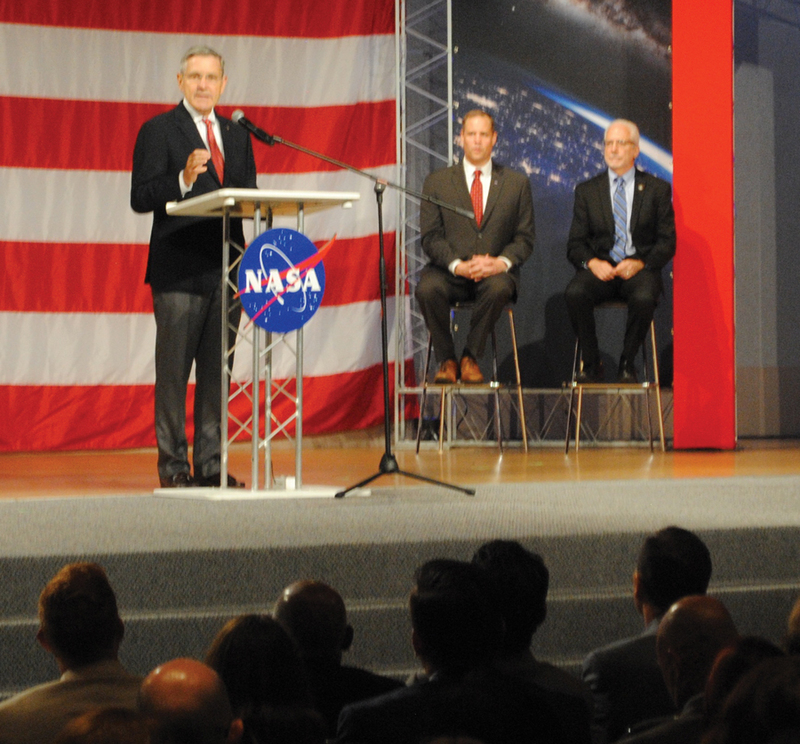 Kennedy Space Center Director Robert Cabana addresses the standing room only crowd at JSC’s Teague Auditorium as NASA Administrator Jim Bridenstine and Johnson Space Center Director Mark Geyer look on. 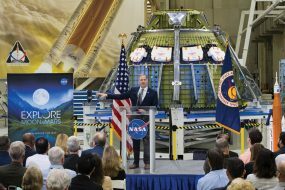 “We’re back,” NASA Administrator Jim Bridenstine told a rousing audience in the Johnson Space Center’s Teague Auditorium. “This is a big deal for our country, and we want America to know that we’re back – that we’re flying American astronauts on American rockets from American soil,” he said as the crowd’s roar reached heights probably not heard around JSC in years. Sweet words to everyone’s ears, especially the nine astronauts who were introduced as America’s first commercial crew astronauts – those who will help increase commercial companies’ involvement in low Earth orbit and possibly take over operation of the space station some day in the future and allow NASA to focus on deep space exploration. Joining him on stage for the presentation were Johnson Space Center Director Mark Geyer, Kennedy Space Center Director Bob Cabana, Boeing Defense, Space and Security CEO Leanne Caret and SpaceX CEO Gwynne Shotwell, who each spoke briefly of their hopes for the future before the new NASA chief introduced the astronauts – five who will fly on Boeing’s Starliner and four who will man SpaceX’s Dragon. NASA introduced the first U.S. astronauts who will fly on American-made, commercial spacecraft to and from the International Space Station – an endeavor that will return astronaut launches to U.S. soil for the first time since the space shuttle’s retirement in 2011. 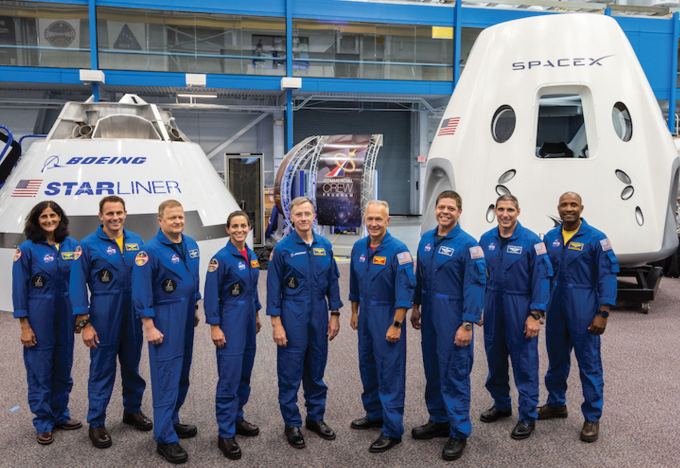 The nine astronauts introduced to crew Boeing’s CST-100 Starliner and SpaceX’s Crew Dragon are, from left, Sunita Williams, Josh Cassada, Eric Boe, Nicole Mann, Christopher Ferguson, Douglas Hurley, Robert Behnken, Michael Hopkins and Victor Glover. 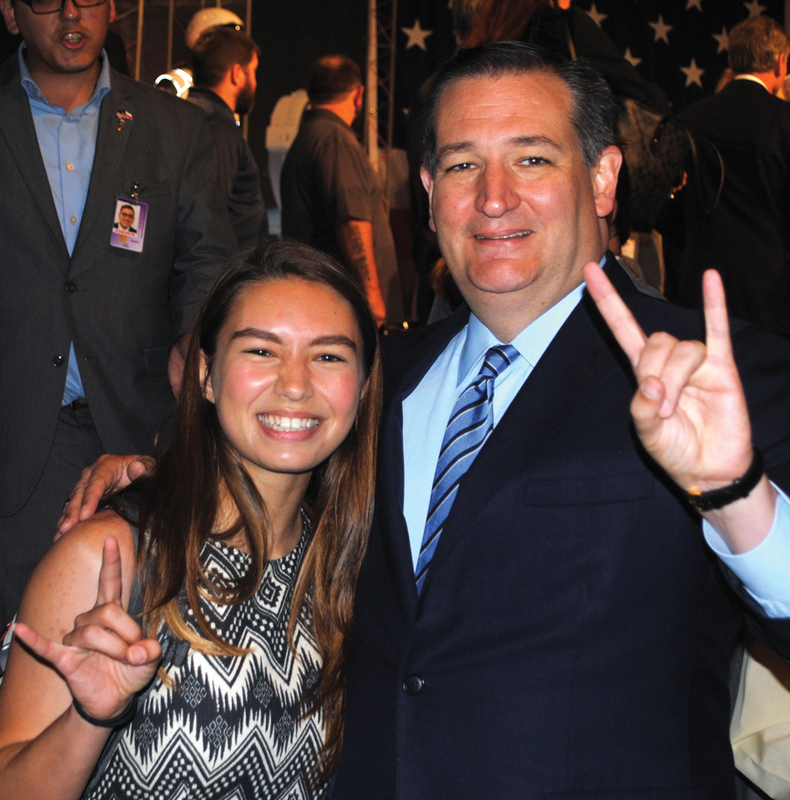 NASA intern and University of Texas student Stephanie Zeller shares a light moment with Sen.Ted Cruz, one of a number of elected officials at the ceremony at JSC’s Teague Auditorium. “All of us are here today because we stand for something new and profound, built upon an amazing legacy, and it is personal for all of us,” Boeing executive Leanne Caret said. “Today we start a new chapter, and we’re so thrilled to be on this journey.” Both companies bring unique approaches and ideas to the development and testing of their systems, which is why NASA selected both companies in September 2014. 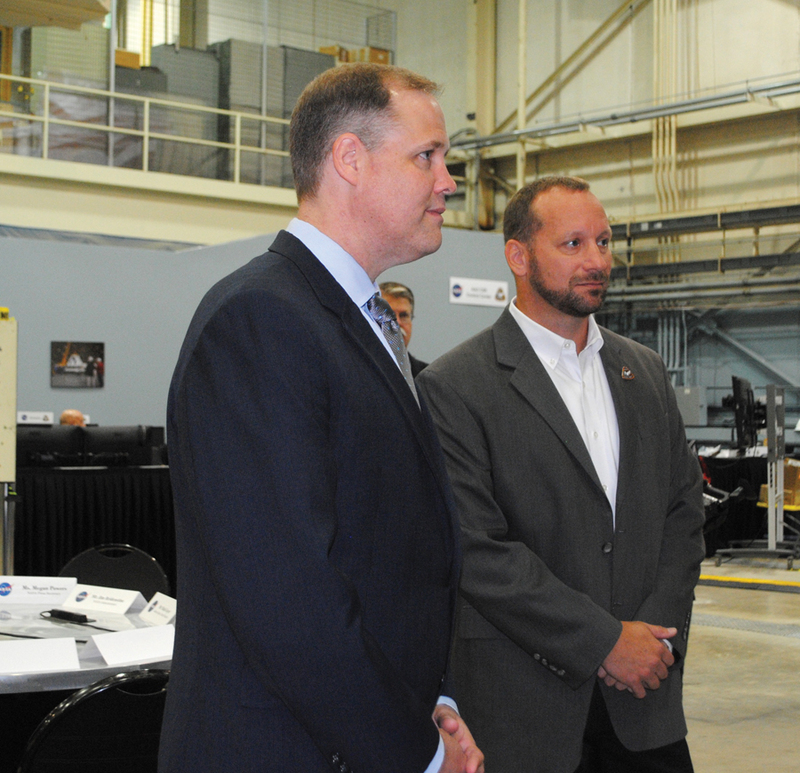 The stage presentation was one of several appearances by Bridenstine during a three-day visit to JSC. On his first morning, the 43-year-old Michigan native got a up-close look at the Orion mockup that is being readied for its major safety test in April to verify that its launch abort system can steer the capsule and astronauts inside it to safety in the event of an issue with the Space Launch System rocket when the spacecraft is under the highest aerodynamic loads it will experience during ascent for deep-space missions. Next, he met with a select group of local reporters, answering a variety of questions about the future of the space station, the Gateway moon orbiting project that involves returning to the moon and is seen as a stepping stone to Mars, and the delays on the James Webb Telescope. NASA Administrator Jim Bridenstine, left, looks over the work being done in Building 9S at Johnson Space Center for the launch of the Orion mockup. Bridenstine started his visit here at a reception at Space Center Houston where he addressed aerospace executives, local business people and elected officials, discussing a change in national space policy providing for an American-led integrated program with private sector partners for a return to the moon, followed by missions to Mars and beyond. 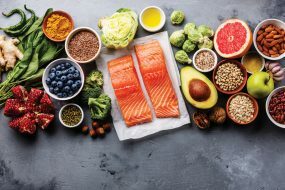 Bridenstine emphasized the importance of the word “sustainable” in the policy. He said, “When we talk about going to the moon, this time to stay, we want the entire architecture between Earth and the moon to be sustainable — in other words ‘reusable.’ We want tugs that are going back and forth from low Earth orbit to lunar orbit to be reusable. We want the lunar landers to be reusable so that they can go back to the surface of the moon over and over again. NASA took another step toward ferrying its astronauts to the International Space Station Sept. 16, announcing that it was awarding the Commercial Crew contract to two American companies — Boeing and SpaceX. Boeing was given a $4.2 billion contract and SpaceX was awarded a $2.6 billion pact, NASA Administrator Charles Bolden told the assembled crowd at Kennedy Space Center in Florida. The SpaceX Dragon and Boeing CST-100 crew capsules will launch from KSC and eventually put an end to the space agency’s reliance on Russia and the $71 million cost per seat. “From day one, the Obama Administration made clear that the greatest nation on Earth should not be dependent on other nations to get into space,” Bolden said. “Thanks to the leadership of President Obama, the hard work of our NASA and industry teams, and support from Congress, today we are one step closer to launching our astronauts from U.S. soil on American spacecraft and ending the nation’s sole reliance on Russia by 2017. “Turning over low-Earth orbit transportation to private industry will also allow NASA to focus on an even more ambitious mission – sending humans to Mars,” he added, apparently hopeful they could meet the November 2017 deadline when the current contract with Russia expires. “Boeing has been part of every American human space flight program, and we’re honored that NASA has chosen us to continue that legacy,” said Boeing Space Exploration Vice President and General Manager John Elbon. Once the tests are successfully completed and certified by NASA engineering experts, each contractor will conduct at least two, and as many as six, crewed missions to the space station. These spacecraft also will serve as a lifeboat for astronauts aboard the station, officials added. “We are excited to see our industry partners close in on operational flights to the International Space Station, an extraordinary feat industry and the NASA family began just four years ago,” said Kathy Lueders, manager of NASA’s Commercial Crew Program. NASA said the companies will own and operate the crew transportation systems and be able to sell human space transportation services to other customers in addition to NASA, thereby reducing the costs for all customers. Why the difference in amounts given the companies? They were given the amount listed in their proposals, the amount each company felt their system would cost, a spokesman said. Blue Origin and a Sierra Nevada/Lockheed Martin partnership also competed for the awards.